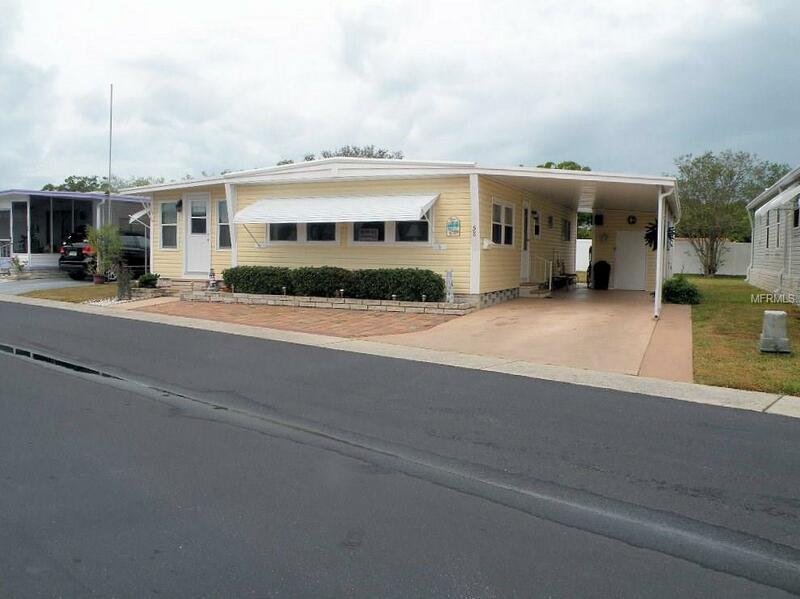 This 2 bedroom 1 1/2 bath double wide mobile home is situated in the pet section of the park. Classic front pavers emphasize this neatly displayed 800 heated square ft. property. The property has vinyl siding, updated windows, a roof-over and lots of space for two cars. The kitchen has gleaming laminate flooring and dishwasher, refrigerator, stove and microwave hood. The lower cabinets are updated and are white with contrasting darker colored counter tops. All the living room and kitchen windows are updated with double pane windows. Off the living room there is a slider leading to a bonus room. Here there are two more windows that are double pane as well as an attractive door to the outside. Laminate floors lead down the hall to a hall bath with its tub and shower attachment. The master suite lies to the left and has two additional updated windows. The master has three closets and an ensuite half bath with a newer vanity and toilet. The quest bedroom is in the back and has two adequately sized closets. Walls are painted with restful color throughout. Most furnishings will remain for the buyer. In 2013 a roof over was added. The washer and dryer are in the utility shed at the end of the driveway. There is also a very generous sized back yard. The list price includes the share of $30,000. Just give a call to see this comfortable pet property. While visiting talk to the neighbors and you will soon see why this cooperative community is such a popular location to call home.